I have been on a poultry and seafood kick since October of last year and I am trying to limit myself on eating red meat (beef and pork - what, no bacon?!). I decided to to make chicken meatloaf instead of the usual ground turkey meatloaf. Ground chicken is generally cheaper than ground turkey at the grocery store, so I have been using it a lot on other recipes, like tacos, burgers, chili, etc. 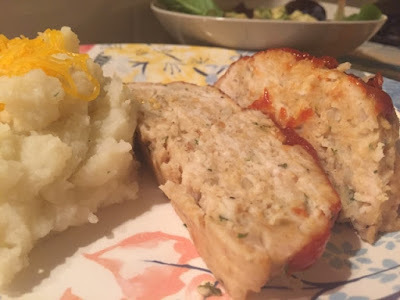 I purchase all my meat from Sprout's Farmers Market, and there was a special on ground chicken breast, so I purchased a package that was about 2 1/2 pounds. This recipe only calls for 2 pounds, so made a couple of ground chicken burger patties and stored it in the freezer for another quick meal. Preheat oven to 350 degrees. 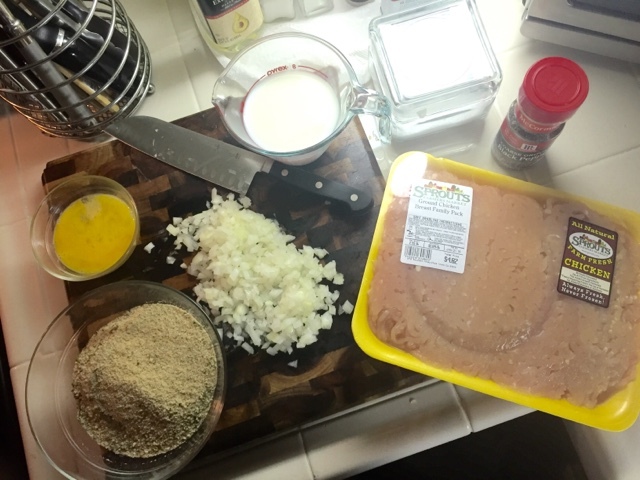 In a large bowl combine the ground chicken, egg, onion, milk, bread crumbs, and salt and pepper (clean hands or a large spatula). Using your hands, form into a loaf and place in a lightly greased 9" x 13" in baking dish or a foil lined baking dish (spray the foil with nonstick canola oil spray). Sprinkle the top with another dash of salt and pepper. In a separate bowl combine brown sugar, mustard and ketchup. Pour over the top of the meatloaf, spreading evenly. Sprinkle a little bit of brown sugar over the top of sauce. 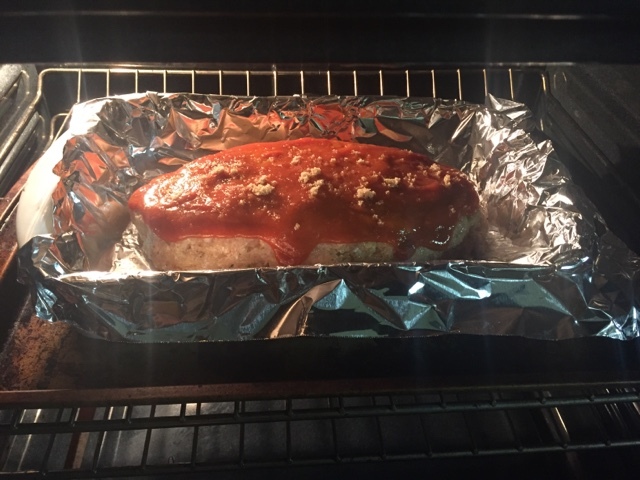 Bake for about one hour and a half or until cooked through. Let the loaf rest for about 15 minutes before cutting into it. It may seem like a LOT of onion after you finely chop it up, but two pounds of ground meat is a lot of meat. Your house will smell amazing while it is cooking and I guarantee that your mouth will water. Ta-da... here is the final result. I served it with homemade mashed potatoes (with a sprinkle of shredded cheddar), and organic baby romaine with creamy balsamic dressing. 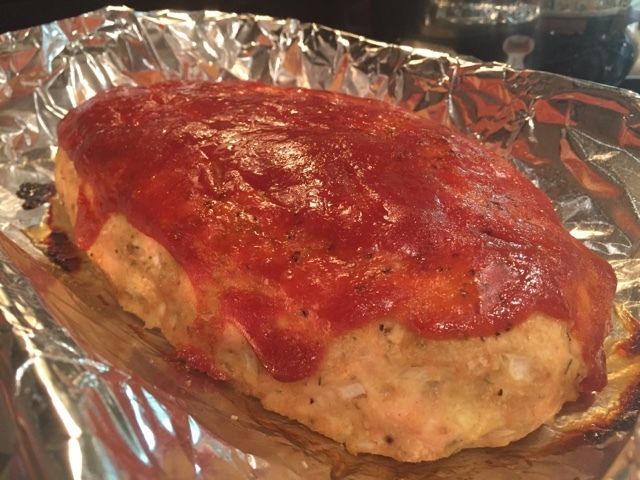 Here is my original post for the No Fail, Turkey Meatloaf. 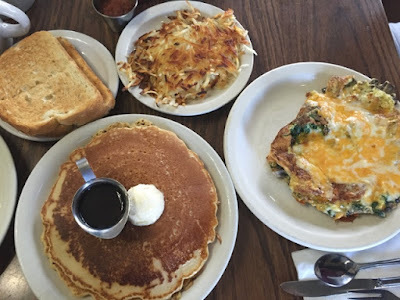 Perry's Cafe is one of those restaurants that you see when you are passing through Interstate 8 or Interstate 5, driving near Old Town, or driving towards the Sports Arena, and you kind of just look at it, wonder about it, and never think twice about it. That is how I felt for a LONG time now, but since my first visit here, I do really enjoy having breakfast here. The lines are always long on the weekends, and because they are a breakfast/lunch place, it closes fairly early (6:00am to 2:00pm). Truthfully, it is a pretty far away from where we live, but when we have time off during the work week, M and I enjoy coming here. 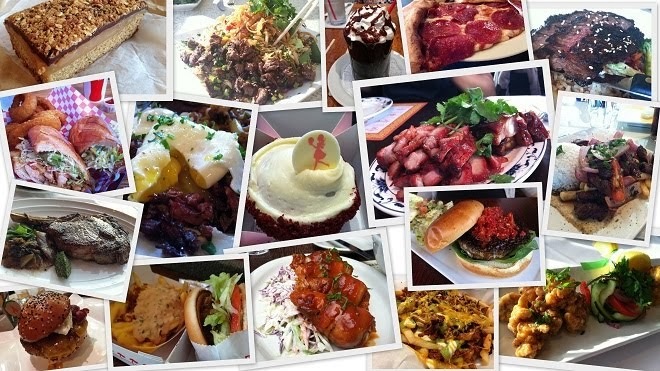 We learned that from the last visit that the portions are huge, so we knew that we were going to split something. Our game plan was this... short stack of pancakes and a frittata. Perry's is known of their egg frittatas. They have so many delicious variations of them. 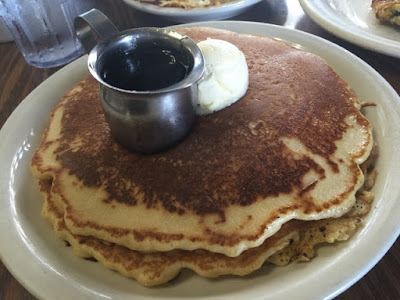 Two fluffy buttermilk pancakes came in a short stack ($5.95). Each pancake was bigger than my head. It is served with warm syrup and a small portion of soft butter. The pancake was soft, comforting and fresh. It is a simple pancake done just right. This is the frittata of choice that we agreed upon. Yum. 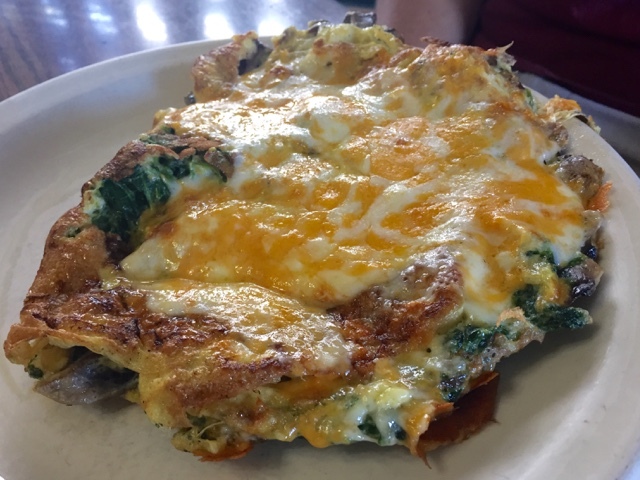 It is the Spinach Frittata ($10.25) that comes with lots of spinach, mushroom, bacon and mixed cheese. We did not order it with the bacon, though. We were supposed to ask for "light cheese" but we forgot. Once we received it, we were like, "Mmm, cheese" and did not mind the cheesy goodness at all. LOOK. If you are a spinach lover, they really load it up with spinach. 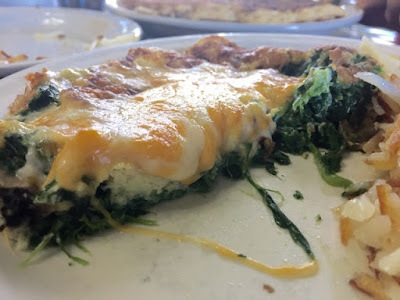 Now, that's a spinach frittata! All frittatas come with a choice of bread and potato. I wanted toasted sourdough, my favorite. And, of course, hash browns! They also offer blueberry or bran muffins and biscuits. Instead of hash browns, they have home fries. You can also opt for the tortillas and beans, instead too! So many options. Our server insisted that we should have the frittata with their fresh salsa. She was right. They were amazing together (make a note). Perry's Cafe is highly recommended for their breakfast. They open at 6:00am and close at 2:00pm, so I suggest going really early for breakfast. Expect long lines, but because I think they turn over the tables pretty quickly, I do not foresee groups waiting for that long. It has been around for a long time, and it is family-owned and run by Perry, herself. You will thank me!